Baskin Robbins knows how to speak to my heart. Give a girl dessert and then a coupon for free dessert! Right now you can print a Buy One Get One coupon for Berry Passionate Frozen Yogurt. 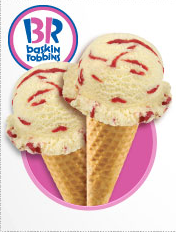 Head into your local Baskin Robbins and enjoy your treat. The coupon expires Saturday 1/5. See more Local Coupons at stores in your area!